How Can I Show Her That Judaism Welcomes Lesbians? This year is the first time my new non-Jewish daughter-in-law will be spending the high holidays with us. She and my daughter will be coming up from New York City and spending Rosh Hashanah with us. Our synagogue is a pretty open-minded and an inclusive one, so I don’t think there should be any issues there, should they both decide to come to services. The hard part is that my daughter-in-law is not a big fan of religion because of her experience in her largely homophobic Christian hometown, and to a degree family, growing up. I know from my daughter that she isn’t too excited about coming up, but is doing it for her. I want to find a way to show how Judaism and the high holidays are special to us and can be meaningful to others without coming off as too pushy or like I am trying to get her to be Jewish, because I am not. Seesaw, how can I make the holiday seem compelling and inviting to her? Like your daughter, I’ve been in a serious, long-term queer interfaith relationship. Though my relationship ended for reasons other than our different religious backgrounds (me, an observant Conservative Jew, her, a lapsed Catholic whose parents were very, well, un-lapsed Catholics), we treated each others’ holidays with the same approach: from a socio-cultural perspective. By doing so, our jointly-celebrated holidays became affairs of cosmopolitanism, a celebrated cultural exchange. What is so unique about Judaism is that it’s not just a religion — it can be categorized as a culture or even a bonafide ethnic group. So think of your non-Jewish daughter-in-law’s perspective as submersion in a cultural experience, not a religious one. Rosh Hashanah might actually be the perfect introductory holiday for this because there are so many cultural elements to it. 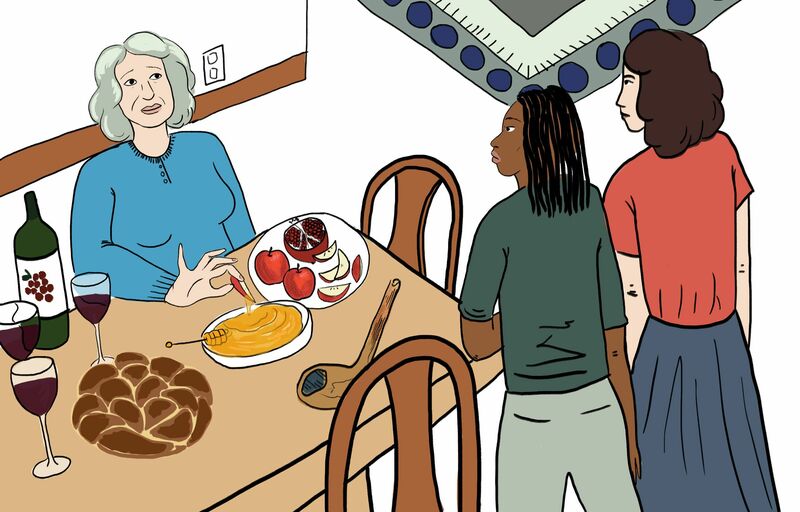 Sure, there are a few prayers at the beginning and/or end of the meal, but these home-based gatherings are more of a celebration of family, community and the rhythms of the year. Important: do not pressure your daughter-in-law to participate in any of the more religious aspects of the holiday, including attending synagogue. While a primer on Rosh Hashanah basics is perfectly acceptable, anything else could possibly induce anxiety, tension, or worse. Her attendance, particularly in light of her antipathy towards her own religious background, is a symbolic acceptance of your belief system and its importance to you; you should extend her the same courtesy. For queer people, more conservative branches of religion can also be a toxic admixture of religious suppression of one’s identity and plain old outright oppression — a constant reminder than one is either subhuman, lesser-than or a “sinner.” These can have disastrous effects on the self-esteem and/or mental health of an LGBTQ individual. All the more reason to create a celebratory environment for your Rosh Hashanah get together and focus on the positive cultural aspects of self-renewal, togetherness and love. J.E. Reich’s writing is recent or forthcoming in Luna Luna Magazine, Nerve, LIT Magazine, Armchair/Shotgun, the Daily Dot, and Volume 1 Brooklyn, and her novella The Demon Room is out now. She lives in Brooklyn. You can follow her on Twitter at @jereichwrites.